A Turkish coffee pot is ideal for brewing. It preserves the genuine flavor, scent, and healthy nutrients. 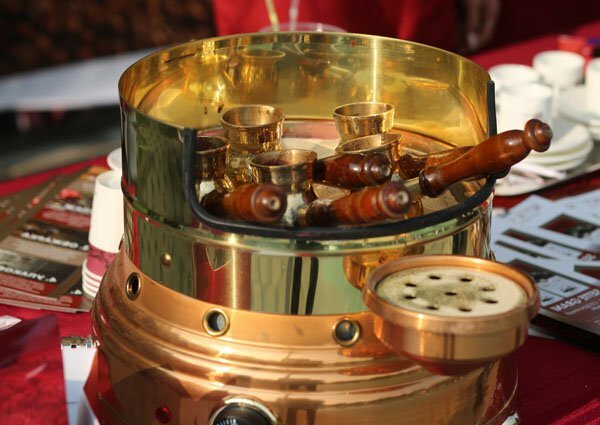 A cezve is a pot designed specifically to make Turkish coffee. Copper is the perfect material to use for “cezve” (pronounced “ jezz-va” ). CEZVES sometimes called The Ibrik. Electric Turkish appliance are available in most electronic supermarkets. When brewing, you will see coffee boil and rise, but the automatic anti-overflow function will keep the crema in. Take a look at the shape. It should be cone-shaped. Good models have pots with wide bottoms and narrow throats. The bigger the difference is the better. It is also important to see how thick the pot’s walls are. It is better to choose a Turkish cezve with a pot that has maximally thick walls. It will evenly heat the liquid. Such cezves produce coffee with a rich flavor. Capacity varies: a 250-300 ml one makes two cups of coffee. A good electric turkish cezve is made of metal. It is advisable to buy one with a long handle made of an alloy that has low heat conductivity. An automatic switch is highly desirable. An electric pot brews three times as fast as a regular one. If you want your hot drink to have the renowned crema top, use finely ground beans. Electric Turkish coffee makers are excellent, affordable, user friendly, and time-saving. They make wonderful hot drinks. To cook coffee in incandescent sand, you need to use a special kind of device. There are stovetop and electric appliances. They use the same principle: the chamber is filled with pure quartz sand, which is heated up on a stove or by an electric heating element. Cezves are half-buried in sand – one per portion, and continue to make coffee based on traditional recipes. Cezves should be positioned in such a way as not to let their bottoms touch the metal surface. Make sure that crema rises and shrinks several times as the drink brews. Do not let it boil: it will ruin your own work. The price of a coffee sand brewer machine depends on the manufacturer and design. If you want an average-priced appliance, you can choose machines made by Johny, Greece. They have a brass or copper body, boast sophisticated design, and are powered by electricity. Machines with exclusive ornaments are more expensive, because they are richly decorated and made of high-value materials. 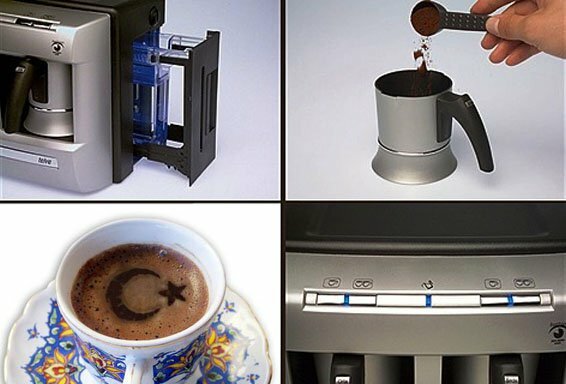 A Turkish coffee maker machine can brew truly Turkish coffee. It is very compact, because it does not feature a water tank. It has a very simple design. It has a Turkish pot, in which you can pour grinded beans, sugar and spices. The machine will do the rest of the job automatically. All you need to do is press a button, and it will make drink in a couple of minutes. It produces coffee with a deep and rich flavor and the signature crema top. Remove the pot from the machine and wait for 30 minutes to let particles sink and the grains finish brewing. Beko is a Turkish brand, made by Arcelik, Turkey. Beko appliances are great in all respects. Their high quality, durability, modern design testify in favor of these device. Beko coffee machines have won numerous international forums in quality and design nominations. 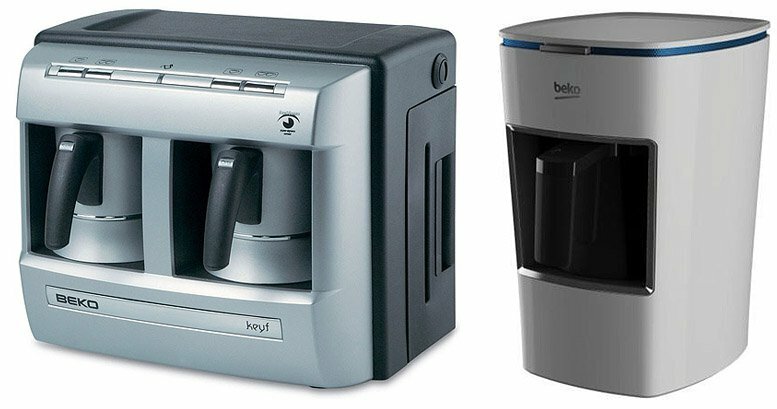 A Beko machine features an automatic hot water portioning function and can brew one or two cups of coffee at a time. 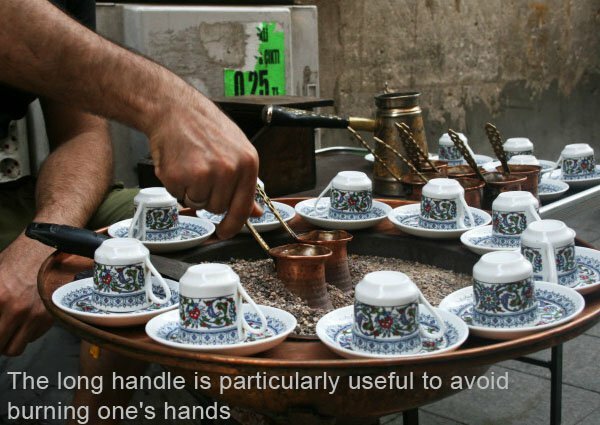 It is ideal for Turkish coffee gourmets, because the drink is in no way different from one brewed in a cezve. It is mandatory that you use powdery fine-ground beans. The SpinJet system ensures automatic mixing, which creates hot drinks with crema that has a certain portion of air. Also, it features an optical crema sensor. Thickness of coffee is adjusted by the CookSense boil control system, and the AntiSpill function will prevent overflowing even if you have absent-mindedly left your brewer unattended. Besides, built-in boil sensors switch it off exactly at the set second. In the end, the machine will give an audio signal to notify you that the brewing is over. Sometimes, Beko machines come with a little surprise – a pack of Turkish coffee or a recipe book. The procedure boasts genuine Turkish simplicity. Pour the ground beans in a cup, add sugar and spices and place the cup in the device. The whole thing lasts at most 2 minutes. Once the drink is ready, please, pour it into another cup. In 30 minutes, when floating grain particles sink, the drink can be served. Beko appliances are compact in size, and they complement interiors of even small-sized kitchens. Arzum Okka is another popular brand of coffee makers. A built-in grinder does reduce grains to dust and produces coffee with a good crema. While a traditional device grinds a grain into 3.5 thousand particles, Arzum Okka produces about ten times more particles. Unlike a Beko machine, it will take 5 minutes for it to produce hot drink, which is going to be richer and thicker.